I hope you’re enjoying this — it might not last too much longer. Rooting for an undefeated baseball team is a delightful and wonderful feeling, a feeling like anything’s possible. Eight years in a row now, a day after the first day, I’ve gotten to feel like anything’s possible, for the Mariners. Of course it turned out for at least the first seven of those, many things were in fact not possible for the Mariners, but this is a perfect one, this feeling right here. Coming out of spring training, you’re ready to re-embrace the baseball routine. Fans everywhere are a little over-confident. But you don’t remember what games really feel like. Win the first game and you only know wins. Lose the first game and you only know losses. Baseball only starts to feel normal when your team has won and lost, but for the time being we only know the 2014 Seattle Mariners as winners. Big winners, as a matter of fact, allowing us to pretend like this team is a juggernaut. It isn’t, but, where’s the evidence? The Mariners were a juggernaut Monday. That’s all the data we’ve got. When the Mariners get around to losing, it’ll be familiar, and we’ll start to entertain impressions both positive and negative. We’ll know what this team is within several weeks. What we think this team is today is unstoppable, and it sure is helpful to be able to give the ball to Felix Hernandez. With Felix on the mound, you always feel like the only team that can beat the Mariners is the Mariners. Sometimes a team comes out of camp and the ace struggles in the opener, and fans get really worried. Nothing to worry about here. I’m not in the business of recaps anymore, especially not a day after the fact, and this isn’t a Mariners season opener game recap. In somewhat recappy form, I will say it’s extra delicious to rip the hearts out of the Angels. I will say I’m a supporter of Abe Almonte, and I’m a supporter of the idea of Robinson Cano somehow making Justin Smoak better, and I’m a supporter of Mike Zunino’s defense more than I’m a supporter of Mike Zunino’s offense. I don’t know why Charlie Furbush was pitching to Mike Trout. I don’t know where Dustin Ackley was running on Albert Pujols’ double. If Ackley hits enough, I’m not going to care about his funny routes. If Kyle Seager hits enough, we’re going to have a lineup. But all I really want to get to is a chart. Last night, a whole lot of things happened, involving a whole lot of different Seattle Mariners. They scored, ten times, against a good baseball team! But sometimes I get King Felix tunnel vision. 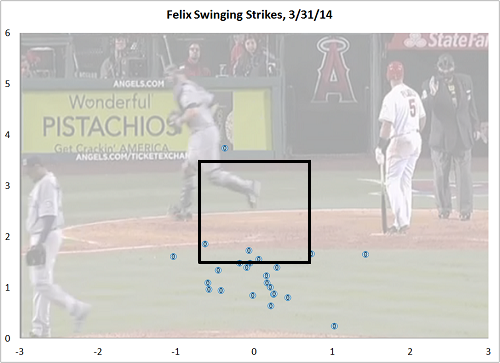 And here’s one display of what Felix did over his six innings of excellent work. Count ’em up. Or, don’t, because two of them are almost perfectly overlapping. Last night, against Felix, the Angels swung and missed 21 times, and they racked up another three foul tips, yielding a total of 24 swinging strikes. All but one of them were low, and the one high one was a fastball to blow away Raul Ibanez. Felix was dominant around and beyond the lower edge, and if you’re trusting of Brooks Baseball’s classifications, the Angels were an unbelievable 3-for-20 trying to make contact with Felix’s changeup. It’s hard to separate the change from the two-seamer, since the changeup is basically a fastball, so the classifications could be off, but let’s not lose the important point. Pitch types be damned; Felix owned the Angels at the knees and the shins. Even the slider that Trout hit out was an inch or two away from being a good slider to a great hitter. And by the way, that isn’t all of it. The Angels had 24 swinging strikes out of 48 swings, giving a game contact rate of 50%. That is the lowest single-game contact rate of Felix’s major-league career. It’s not even all that close. It wasn’t, of course, the best start that Felix has ever had, but by one statistical measure, it was his most unhittable start. He’s made a lot of starts. The Angels have a good lineup, and after the first two batters, Felix was like, knock if off, go away and sit down over there. He was that much in control, and he put the Mariners in position to go wire-to-wire. Presumably they won’t, but we’ve earned a day to pretend. It was a good game for baseball as a sport, overall. People got to see King Felix at his best. People got to see Mike Trout go deep against one of the best. And then the Mariners won, and while it’s not like the Mariners are America’s Team, they are in position to be a little lovable on account of how bad they’ve been for so many years. The game featured some of the most talented players in baseball, players you can respect even from the other side, and I’m glad I got to see Trout keep being amazing, in a way. I’m also glad Trout ended up bummed out and his team got booed in its own home opener. The Mariners did that! One game represents 0.62% of a full baseball season. There’s an incomprehensible amount of baseball left. But if the Mariners were projected to finish, say, .500, now you add about a half-win to the projection. And that increases the playoff odds by a few percentage points. You never earn your way to the playoffs in April — or March — but every win goes in the same win column, and when a division race is expected to be tight, it’s never too early to try to pull out in front. The Mariners might be worse than the Angels, Rangers, and A’s. The Mariners, right now, are in front of the Angels, Rangers, and A’s. And how much worse might they be, really? No one’s ever complained about having a lead. The Mariners play again soon. They might lose. Until they lose, I don’t even remember what losing means. I only know King Felix, ten runs, and sweet sweet victory. Baseball’s a good friend, sometimes. Maybe it’s because the Angels didn’t have their hitting coach…they were channelling some Eric Wedge aggressiveness up there. According to ESPN, Trout was 0-7 against Furbush going into that AB, and that’s why Furbush pitched to him. I listened to the Angels broadcast team when Felix started hitting his groove and making the Angels batters look silly. In listening to other broadcasters when Felix is pitching well, and that is most of the time, their reaction to Felix the opposing pitcher falls into one of three classes: denial, jealousy, or awe. The Angels radio broadcast team were clearly in the latter group. Trout has never gotten a hit off me. True story. I thought about Felix yesterday. Today I’m thinking about Erasmo punking Pujols with that changeup. I love Felix. We are so lucky to have him.